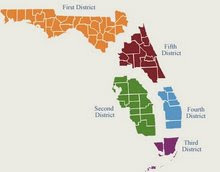 The Florida Legal Blog: "The Fourth Amendment Has Drawn A Firm Line At The Entrance To The House"
"The Fourth Amendment Has Drawn A Firm Line At The Entrance To The House"
In Mestral v. State (3D08-216), the Third District reversed the trial court's order denying a motion to suppress evidence because the police conducted an unconstitutional search. The police took defendant-appellant Mestral into custody in his front yard and conducted a protective sweep inside his house. Because the police entered without consent, exigent circumstances, or a search warrant, the protective sweep was illegal. The motion to suppress evidence should have been granted. “[T]he Fourth Amendment has drawn a firm line at the entrance to the house.” Payton v. New York, 445 U.S. 573, 590 (1980). Entry into a home is permissible only by consent, a warrant, or exigent circumstances. No such circumstances existed here. The detention of the defendant occurred in the front yard. Even if the police had not ascertained that the defendant resided there, the wife was present and the officers knew she resided there. The question, then, is whether the police could, as a matter of routine practice, enter the dwelling to conduct a protective sweep where the defendant was detained in the front yard. The United States Supreme Court has rejected the idea “that an arrest on the street can provide its own ‘exigent circumstance’ so as to justify a warrantless search of an arrestee’s house.” Vale, 399 U.S. at 35. It is therefore clear that an entry into a home to conduct a protective sweep cannot be done simply as a matter of routine practice. In this case the officers entered the residence as part of a routine practice and not on the basis of any articulable facts which would warrant a reasonable belief that there was any dangerous individual inside who posed a threat to those on the arrest scene. Because the protective sweep was impermissible, the motion to suppress evidence should have been granted, and the evidence should not have been admitted at the defendant’s trial.